• Factory overclocked to 1512 MHz boost clock. • Stylish PULSE backplate and radiator shroud design. To effectively cool a factory-overclocked GPU, SAPPHIRE is using a large heatsink with a copper base and a set of four 8 mm heatpipes. The card’s heatsink actually extends past the short PCB for an increased heat dissipation area. A robust cooling module is also applied to the VRM section, with separate heatsink units connected by a single 6 mm heatpipe and aluminium base. There is also a high thermal conductivity pad on the backplate. Two efficient dual-ball bearing fans spin at a nominal speed of up to 1650 RPM, maintaining a great airflow and quiet operation. Intelligent Fan Control III system ensures the fans start precisely at 55 degrees Celsius, providing a passive, noiseless cooling in idle. 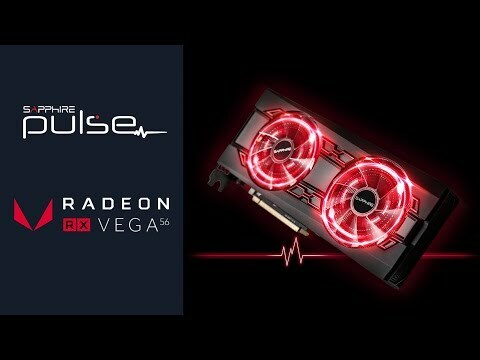 8GB Sapphire Radeon RX Vega 56 PULSE, 14nm, 3584 Streams, 1208MHz, 1512MHz Boost, 800MHz HBM2, DP/HDMI is rated 5.0 out of 5 by 1. Rated 5 out of 5 by Tango from A Hidden Gem Gaming performance will average out to be 10% faster than a GTX 1070 and be the same as the GTX 1070 TI out of the box. Should Windows 10, still have Relive Edition of drivers as default drivers, you will need to download Adrenalin drivers for gaming, before installing the GPU and disconnect from the internet until you've installed the Adrenalin drivers. Should you want to play Vulkan titles like Doom and Wolfenstein II New Colossus use 18.3.4-March23 drivers as Adrenalin Edition 18.5.1 and Adrenalin Edition 18.4.1 do not work with some Freesync monitors. Star Wars Battlefront 2 - has an odd bug, when you first install drivers that produce stutters. This requires the resetting of Shader Cache, go to game profile: switch off the Shader Cache and then switch it back on the "AMD optimised" setting. Key features of the Saphire RX Vega 56 - improved cooling, improved 7 phase power delivery with a shorter PCB, impressive looks in a windowed PC case and lower power draw of around 204watts measured when using a Platinium PSU. It should be added: the Nitro version has even more impressive looking RGB options and a higher out of the box speed. Overclocking with standard settings (P6 and P7 undervolt ranging from 1080mv and Powertune +50% and HBM2 900mhz with aggressive fan profile of 1600-2100) is very impressive thermally, acoustically and performance wise. 38% increase in power consumption versus FPS increase: Far Cry 5 Ultra 1080p Stock 99FPS 1080p UV 8% best result 106FPS RX Vega 56 does not excel at low-resolution gaming and these results are not surprising. 1440p Stock: 75FPS 1440p UV 8%: 84FPS A 12% increase in FPS (Star Wars Battlefront II: Galactic Assualt on it's most demanding maps - 14% higher FPS at 1440p) 2160p (4K)Stock best result: 35FPS 2160p (4K) UV 8%: 45FPS A 28.5% increase in FPS. Finally, just to double check the 2160p (4K) increase in Far Cry 5 in another game at 2160p (4K) - Doom sees an FPS increase of around 30% at this resolution with the 8% UV settings compared to stock. And, Wolfenstein II New Colossus sees around a 19% increase, but this game is (already) very well optimised for 4K gaming with RX Vega GPUs new feature set. At 2160p, there is a very nice increase in FPS versus the extra power draw. 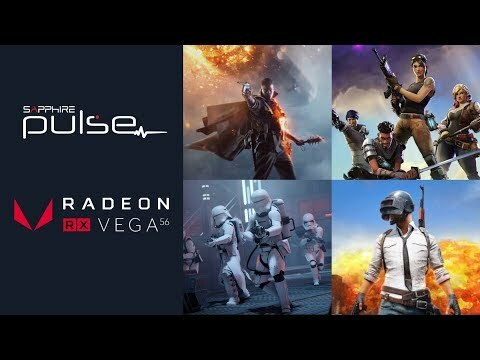 Overall, Sapphire has successfully built on the Vega architecture for high-resolution gaming.